The World Bank’s latest report on Africa claims that the Congo (Brazzaville) has a rate of economic growth of close to 10 %, one of the highest on the continent, nearly as good as the Mauritius Island and Botswana. A dismaying piece of news, since this was a year in which the Congo experienced a terrible civil war which had ruined (among other things) its economy ! According to some unofficial information provided by a member of the Bank, the figure was calculated on the basis of the funds given (or promised) by the Western nations, the IMF, the World Bank and others for the reconstruction of the country. The sums are added up and translated in terms of rate of growth of the GDP. Good thinking ! In the same line of thinking, the Kosovo should have the highest rate of economic growth of its history this year, and probably the highest in the world. OK, lets say 25 %. 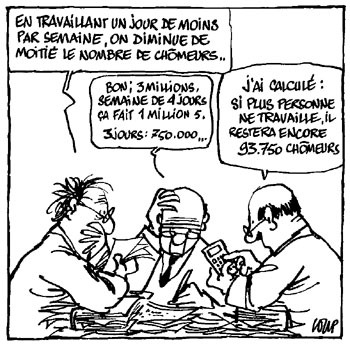 — if we give one day a week off, we halve the number of unemployed..
— I’ve got it calculated. If everyone stops working we’ll still have 93,750 unemployed.